In LEGO Batman a stampede of notorious criminals have busted out of Arkham Asylum. It's up to the Caped Crusader, Batman, and his side-kick, Robin, to sweep Gotham clean of criminal activity using everything at their disposal, including crime-fighting vehicles as well as several baddie-bashing bat gadgets. 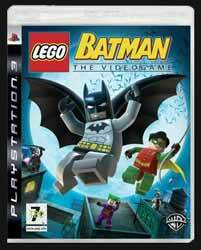 Following on from previous LEGO console games, Batman uses a tried and trusted format to bring followers of the franchise another enjoyable offering. The one aspect where this game differs when compared to previous LEGO games, like Star Wars and Indiana Jones, is in the cut sequences. Because previous LEGO games followed a story line that followers of the films were familiar with, the cut sequences simply paid homage to some of the movies memorable moments and tacked on a few gags. With Batman the narrative is an original story line, so we get an original series of cut sequences. While some of the earlier scenes are a little dull, they do get much better as the game goes on. The game play is pretty much as we've come to expect - only with a few extra bells and whistles thrown in to keep the franchise fresh. You start the game as Batman and Robin and must work your way through each stage of three main games. At the end of each segment you have to take out an Arkham Asylum escapee and at the end of each main game you'll have to take out that level's main boss (For level 1 it's The Riddler; for 2 it's The Penguin; and for 3 it's The Joker). As you progress through each level you can swap between Batman and Robin as well as changing your costume in order to help you complete certain challenges. For Batman these costumes include things like a glider suit (to enable you jump longer distances), a weapon that destroys glass, and the ability to set bombs to destroy large items. For Robin you can get things like metallic boots (to help you climb metal walls) and the ability to control machines. But the costume change machines are hidden and have to be found before you can continue through the game. This aspect, more than any other, is what lets the game down ever so slightly. You are always given a costume change machine near where it's needed. There's never a selection of machines close by so that you have to think about which one to use - if you see one then you know what your upcoming problem is going to be. I couldn't help feeling like my hand was being held by the developers as they led me through the game. You are never left wandering in too large a space. If you can't progress then the answer to your problem is never far away. The levels are pretty easy to complete, but for the younger gamer I'd say that the difficulty is just about right. And, as with previous LEGO games, completing the story mode segment of the game is just the start. Once you've completed one of the three main games you can access the villain mode. Here you can enter Arkham Asylum (which functions like The Batcave in 'hero' mode) and play another three levels but from the villains point of view. The Batcave/Arkham Asylum allows you to choose the level you want to play, as well as walk though your trophy room (which grows as you collect items in each level) and buy upgrades (including unlockable characters, videos, data on your foes and other extras). And once you've complete each level you can revisit it with different character or costumes in order to access areas that were impossible before - unlocking additional content. Also worthy of note is the music, taken from Danny Elfman's score from Tim Burton's first Batman film, which in place is used incredibly well. To sum up, this game is just as entertaining as previous LEGO games. This will keep you happy for quite some time and it's certainly a game you'll come back to in the future.